Children living with an adult gun owner who misuses alcohol are at increased risk of self-harm and interpersonal violence. Over 250,000 children live in a home in Washington where a firearm has not been safely stored. Children living with an adult gun owner who misuses alcohol are at increased risk of self-harm and interpersonal violence, a recent study found. Guns in such households sometimes are loaded and not safely stored, according to the study by UW Medicine’s Harborview Injury Prevention and Research Center and the University of Washington’s School of Public Health. In Washington state, an estimated 470,000 children under 18 live in a firearm-owning household. Among them, over half live in a household in which a firearm has not been safely stored by being unloaded and locked up. This study, which was the first of its kind to investigate this association at a statewide level, was published November 19 in JAMA Pediatrics. The researchers looked at Washington state's Behavioral Risk Factor Surveillance System data from 2013 and 2016. The 5,530 participants were asked questions regarding firearm ownership and storage practices through a four-question module after answering questions on alcohol consumption and sociodemographic characteristics about any children in their household. In firearm-owning households, 67 percent of children living with an adult who misused alcohol were exposed to at least one unsafely stored firearm, compared with 51 percent of children living with an adult who reported no alcohol misuse. 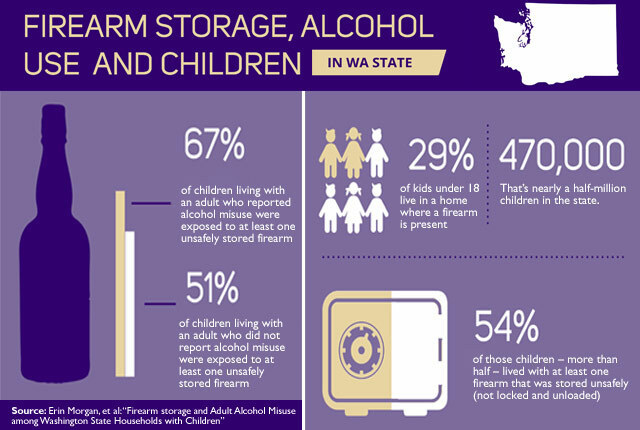 “This research indicates the need for improved firearm storage in homes with children,” said Erin Morgan, lead author and a doctoral student in the Department of Epidemiology at the UW School of Public Health. “Sixteen percent of youth under the age of 18 in Washington state live in a home where a firearm is stored in a way other than locked and unloaded. Kids who live in a household with an adult who misuses alcohol are more likely to live with an unsafely stored firearm. Given that these children may already be at heightened risk for injury, this can be a dangerous combination,” Morgan said. According to prior research, young people are at a vulnerable age for self-inflicted and interpersonal violence, such as suicide and bullying. These factors may be exacerbated by alcohol use among parents or guardians. The first step for decreasing chances of injury is for households to safely store their firearms. They need to be unloaded and locked in a secure area.. According to Morgan and her colleagues, more can be done on a community-level through safe-storage messaging. Contributing authors of the study were Ali Rowhani-Rahbar, the Bartley Dobb Professor for the Study and Prevention of Violence and associate professor at the UW Department of Epidemiology, Anthony Gomez, Manager of the Violence and Injury Prevention Unit at Public Health Seattle and King County, and Frederick Rivara, professor and vice chair of academic affairs at the UW School of Medicine Department of Pediatrics. The study was funded in part by Grandmothers Against Gun Violence. -Annie Pellicciotti, communications manager of the UW Department of Epidemiology, compiled this report.